Central Florida, with its world class theme parks, has become the vacation capitol of the world. But let’s face it, these places are EXPENSIVE. Yes, they are worth the price of admission. But when you have to pay $75 per person for one day in a theme park (not to mention all the food, souvenirs and beverages) it can take a huge chunk out of your vacation budget. Yet, amidst the chatter and shouting of the major attractions, Central Florida has so much more to offer–And you might be surprised to learn how much of it is free or very low cost. The primary purpose of this blog is to expose the underrated or off-the-beaten-path destinations that get drowned out in the clutter of the major attractions of Central Florida. 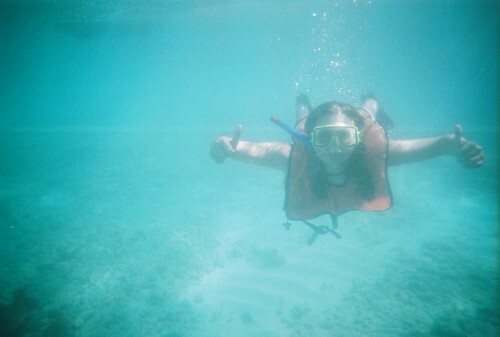 These are often wonderful vacation spots that many guests don’t find because of the sirens‘ calls of the big boys. Still, you can vacation to this area on a shoestring if you want. And since there are so many major attractions, it is relatively easy to have a fabulous vacation with world class accommodations and service on a very limited budget. Rent a vacation Home with a private pool–No, I’m not just saying this because I own the vacation rental home company, I own the vacation rental home company because I sincerely believe it is the best way to vacation. If I thought a hotel or RV park was better for my guests, I would sell this business and buy one of those. Taking a day to relax by the pool in your own, private vacation home is a real treat and a real money saver! Caladesi Island State Park–This pristine island beach is ranked as one of the top beaches in the entire USA! Perhaps it retains its natural serenity because no vehicles are allowed on the island–It can only be reached by boat or ferry. It is on the gulf coast, near Tampa, so there are not many waves. 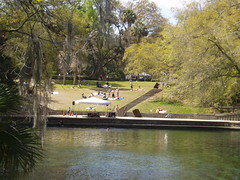 But there are white sand beaches, kayak trails, picnic tables, shelters and Florida wildlife. Ocala National Forest–Huge springs, twisting streams, lakes for fishing and water skiing plus you can walk the trails that will remind you of Gregory Peck’s classic role in The Yearling! 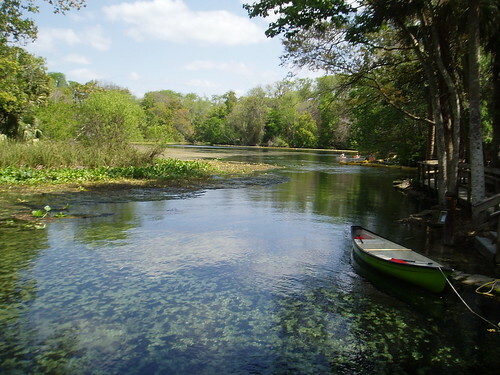 Wekiwa Springs State Park–This huge spring provides the perfect, old fashioned watering hole for a cool dip in year round 72 degree water. 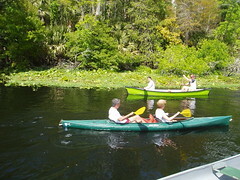 Or enjoy a kayak or canoe trip down the Wekiva River. 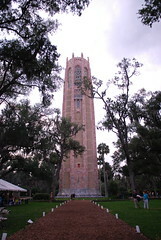 Spook Hill and Bok Tower–Spook Hill is a curious anomaly–An optical illusion makes it seem as though your car is rolling uphill. 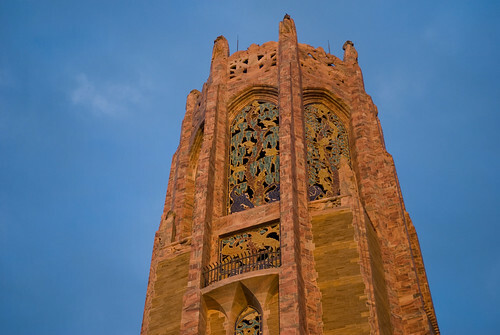 Nearby Bok Tower is a beautiful Carillon built by Edward Bok and set in a colorful garden where peace seems to emanate from every corner. Geohashing–This is not indigenous to Florida. You can geohash anywhere. But this link to my blog post will explain how I found an unexpected vacation that cost nothing and helped me to de-stress when Number One Son introduced me to the concept of geohashing. West Orange Trail–This 22 mile “rails to trails” biking or walking trail goes from Clermont to Apopka passing through quaint towns, like Winter Garden. I had a very rough day yesterday. It was so rough, that early in the morning I finally just threw down my office phone, walked five miles home (Mrs. LanceAround had the car) and laid on my bed and cried. So, let me translate for Grammy: Randall’s system gives you the geographic coordinates (longitude and latitude) for a single point somewhere within 50 square miles of where you live. There are thousands of these specific points throughout the entire world. So everyone is within 50 miles of a point. This point changes every business day, based on the stock market opening. Your mission, should you choose to accept it, is to physically go to that geographical point within the graticule (50 square mile area) where you live. What are you looking for? Nothing. Where are you going? Often, to the middle of nowhere! Using his trusted Tom Tom GPS, Number One Son drove us to a dirt road 30 miles from home and approximately one and a half miles from the location of the coordinates within our 50 Sq. mile graticule. There, we encountered a locked gate. Ignoring the geohashing’s guideline to not trespass, we climbed the gate and walked down the dirt road until the reference point was about three quarters of a mile due west through the wild. We had to ford a stream, jump several barb wire fences, orienteer through cow pastures, through several wooded areas and past a lot of undergrowth. Finally, the marker on the Tom Tom indicated that we had reached our coordinates. We opened the bottles of water we brought along and toasted our success. We had managed to get to nowhere and found nothing. I was tired, hungry, sore and felt as though I was going to faint. But I also felt better than I have in a long, long time. Number One Son and I just smiled and laughed as we gazed around at the open pastures, woods and cow herds. On the way back, we found truck tracks that made it easy to navigate to our van. The adventure took so long that the sun was setting, sending pale streaks of vivid tangerine across the horizon and revealing the bright planet Venus in the southwestern sky. We also encountered a roving skunk and heard the increasingly loud cow calls from the neighboring fields. 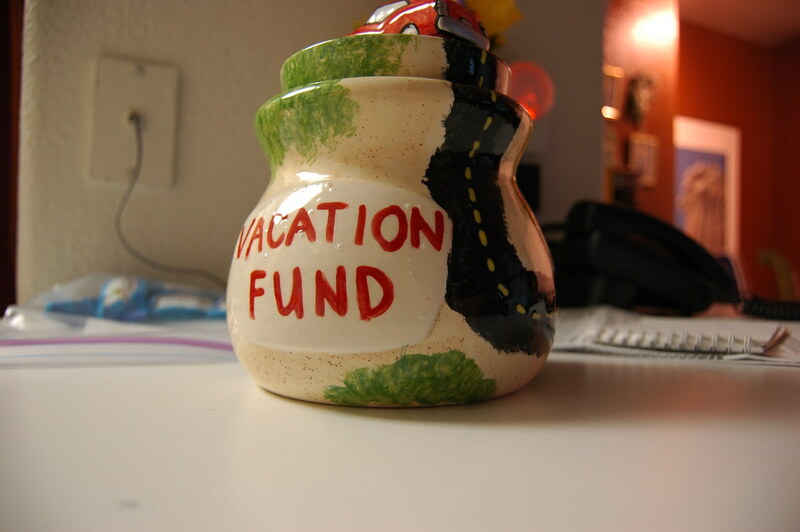 My business is to help people have the vacation of a lifetime. But how do I vacation? Usually, I don’t. But thanks to Randall Monroe and Number One Son, I discovered a wonderful, quick and no cost vacation by seeking nothing in the middle of nowhere. I often hear people talk about their trip to Disneyland, a theme park, a NASCAR event, a water park or some other touristy destination. But rarely do I hear someone talking about the incredible experience they had at one of our nation’s 380 plus national parks–These include the well known, large national parks such as Yosemite, Grand Canyon, The Blue Ridge Parkway (the most visited national park), Yellowstone National Park (the granddaddy of them all), as well as the National Landmarks, National Historic Sites, National Battlefields, National Seashores and over 20 other national designations. Did you know that at over 13 million acres, the Wrangll-St. Elias National Park and Preserve in Alaska is our nation’s largest National Park? At .02 acres our smallest National Park is the Thaddeus Kosciuszko National Memorial in Pennsylvania? I grew up about 20 miles from this memorial and had never even heard of it until listening to an NPR special several months ago. I’ll let you follow the link to find out why we have a memorial to Thaddeous, a rare and remarkable person! National Parks are truly one of the crown jewels of our nation. They provide a phenomenal, unique and educational experience for a modest cost. They are open and accessible to all and have something of interest for everyone of every age, physical ability or educational background. Their employees are knowledgeable and dedicated. Their facilities are top of the line. Their educational programs and displays rival the best museums and science centers of the world. So why don’t I hear more people talk about their trip to a national park? I don’t know about that, but I do know that the Florida Everglades National Park is a fantastic place for you to experience. Did you know that the Shark River Slough, that flows through the everglades, can be as wide as 20 miles? That the flat topography of Florida means that the river can flow as slowly as 1/4 mile in 24 hours? That it could take a drop of water over four years to go from the top of the Kissimmee chain of lakes to the southern tip of Florida? 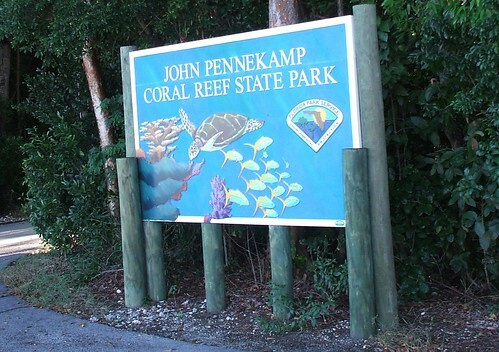 The Everglades National Park is huge and has four different visitor centers. Mrs. LanceAround, Number One daughter and I visited the Ernest Coe and the Shark Valley visitor centers. 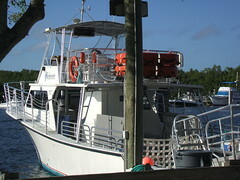 At Shark Valley, the main attraction is a 15 minute round trip tour that goes deep into the vast Shark River Slough. 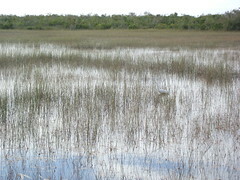 Since the water is so slow moving, this area is often misnamed as a marsh or swamp. 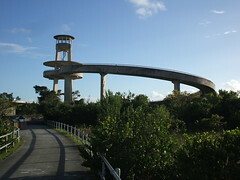 You can walk, ride a bike (they have them for rent) or take a guided tram tour seven and a half miles to a very futuristic looking tower that allows you as much as an 18 mile 360 degree panoramic view of the wilderness river slough. It is easy to take in this view and imagine what it must have been like for the first native settlers of this land to encounter such a harsh wilderness. Even Number One daughter, who had resumed her teenage angst after the exhilarating time we had snorkeling the coral reefs that morning, perked up considerably as she leaned out of our tram to grab a photo of the seven foot alligator sitting with mouth agape just in front of our tram. Along the tour, you will see many alligators who use the macadam road to catch some additional heat, lots of bird species, and perhaps other wildlife such as a turtle or the elusive Florida bobcat. 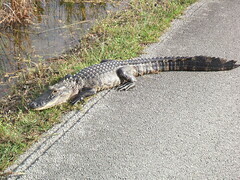 Yes, if you are on a bike you could even come face to face with a gator. You will discover that if you follow Florida law and do not feed or harass the gators and you stay at least 15 feet away, they are no trouble. Forty miles away, The Ernest Coe visitor’s center is more like a museum. There is an excellent movie that teaches about the natural diversity of the Everglades but also gives a sobering picture of how man’s attempt to alter the Florida environment for the sake of development has almost destroyed this essential habitat and how we are now scrambling to save it. 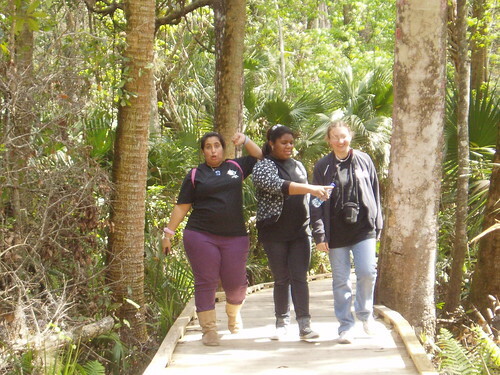 After the movie, you can take a short walk with an park ranger and view many of the diverse wildlife, including lots of gators and birds, while the ranger expertly teaches you about what you are seeing. Mrs. LanceAround was not in the mood for the brief walk along the boardwalk pathway with the park ranger. She gamely went along anyway and by the end of the walk she and Number One daughter were excitedly snapping photos of the multiple alligators lying heaped upon one another in the wetlands below the boardwalk. This blog tells only of our modest, car riding experiences within the park. For the more adventurous, there are multiple campsites, canoe or kayak routes, boat tours, walking paths and campfire programs. National Parks don’t engage in flashy advertisements in an attempt to entice the almighty tourist dollar. 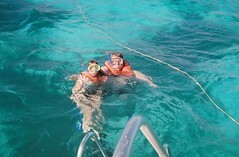 But for the savvy traveller wanting a well rounded experience, they are worth putting on any travel itinerary. Like many men, I don’t like to shop. I am blessed in that I married a wonderful woman, who also does not like to shop, providing one less opportunity for contention in our marriage. However, I have had two shopping experiences in my life that I have found astonishing. Several years ago Mrs. LanceAround and I took a trip to London. I was dumb enough to order new shoes for the trip. When they were a wee bit too tight I was even dumber to believe that the leather would stretch. Walking around the Victoria & Albert Museum, however, my feet finally lost and the shoes won. We asked one of the guards where the nearest shoe store was. She told us that Harrods was just a few blocks down the road. I painfully walked those few blocks, dreading the shopping more than the pain in my feet. I was not prepared for just how incredible a place Harrods was. We bought new shoes (actually walking sandals), browsed the bookstore, found the chocolate shop, marveled at the Egyptian department, ate at the cafe, bought souvenirs and even bumped into Mohamed Al Fayed and his bagpipe band in a back stairway. Harrods was a remarkable place. Turn the clock ahead to this year and we find ourselves with another remarkable shopping experience. 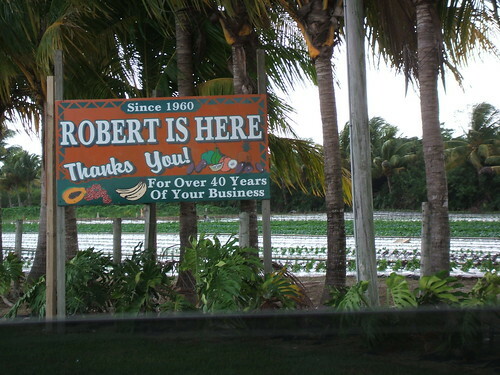 This time we are driving down a back road to Everglade’s National Park when we encounter a building with the words “Robert is Here Fruit Stand” in large letters across the top. About ten times larger than your typical roadside fruit stand, Robert is Here features large square tables piled high with fresh oranges, watermelons, avocados, papayas and other assorted fruits and vegetables. There is also a section of packaged foods such as rum cakes, honey, jellies and a wide selection of Robert is Here branded sauces. 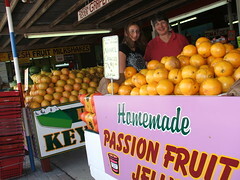 There is an enclosed section with a counter that makes fresh milkshakes in such exotic flavors as passion fruit, guava and their local favorite, key lime. And, reminiscent of a scene from the movie Pulp Fiction, every milkshake was priced at five dollars. Walk out back and the store becomes a mini tourist attraction. 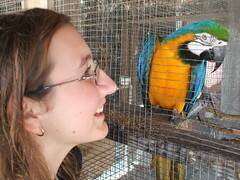 There are large Macaws and parrots, some of which greet you with a “hello.” There is a free petting area featuring donkeys, emus, various other farm animals and a couple of roosters who frequently crow. Beyond the farm animals are cultivated farmland that appears to provide much of what is sold. I asked one of the employees how much of what they sell is actually grown there. He noted that it is important to keep the store stocked, even in the off season, so they do need to frequently import items from far away. He did say, however, that their mission was to buy as much local food as possible to support the local farmers and they also grow a small amount of what they sell themselves. The literature at the store notes that Robert was six years old when, approximately 50 years ago, he set up a stand to sell food at this very corner. Business was not good the first day, so his father made a big sign that said “Robert is Here” the next day and, as they say, the rest is history. Mrs. LanceAround wondered if I was going to write a positive review of this place. 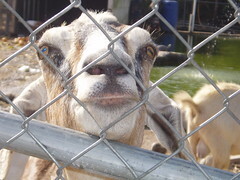 I noted that I was and she was a little disappointed mainly because she felt as though the cage animals looked lonely and sad as they were put on display for the public. I agreed with her and said I would mention both that and the fact that this place may present an image of a small, local fruit stand, but the reality is that they are like most stores, stocking wares imported from all over the world. This blog will be the only review in the entire world where a writer recommends two places for shopping and one is Harrods in London and the other is Robert is Here Fruit Stand just outside the Everglade’s National Park! Amber’s Montessori School asked Mrs. LanceAround and I if we could help drive the students on a field trip to the Maitland Art Center. Since Grammy is visiting us for only two more days, we thought she would really enjoy having a day with her granddaughter and her school friends. 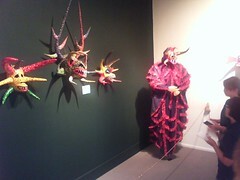 The purpose of the trip was to see an exhibition of Puerto Rican Carnival Masks. I love art centers. Yet, sometimes little hole-in-the-wall art centers can be tedious. A display of Puerto Rican masks did not sound very enticing. At times like these, I try to remember the words from Shakespeare’s A Midsummer’s Night Dream—“Never anything can be amiss, when simpleness and duty tender it.” Hmmm, didn’t work. I prepare for a boring morning. I believe I am being ingenious and erudite. My daughter just thinks I embarass myself. Towards the end of our trip, as we turn onto Packwood Avenue in Maitland and bob along the narrow red brick road, I notice a large, wall-enclosed area on both sides of the road dotted with the most beautiful and tranquil Spanish style cottages decorated with Aztec and Mayan sculptures and bas relief cement blocks. This is my first clue that I could be wrong about my preconceptions of this day. It would only get better. Yet, It would only get better. The main gallery of the art center displayed the most fantastic masks, paintings, costumes, and educational displays of how the art was made. I was mesmerized. So were the students. Small notebooks whipped out as the students took notes. Pictures were taken and you could see young minds at the height of engagement as they quietly and eagerly whispered and pointed at the displays. Still, it would get even better. Our guide for the day had prepared blank miniature masks made of acorns for the students to use to create their own works of art. We left the gallery and walked through an ancient, artistic gate, to an inner courtyard. Here, old brick walkways meandered around fountains with colorful, floating sculptures, past more gated archways weaving in and out of small Spanish-style cottages with bright red tiled roofs. In two of these were tables, chairs, small masks, and art supplies. The students quickly and eagerly went to work. Mrs LanceAround and I took a stroll through the rest of the courtyard. I wish I were a good enough writer to convey the feeling. I wish I were a good enough photographer to capture the mood. Suffice it to say, that simply being in that environment inspired an artistic side of myself that has sat dormant too long. The courtyard complex was dotted with places to sit, nooks and crannies, sculptures, water features, intricately designed gates, brick paths, beautiful landscaping, small artistically designed buildings. There were studios (both indoors and out), areas to do welding, ovens to fire works of art, occasional containers of art supplies of various kinds. Every now and again we would happen upon someone engaged in work. Was it administrative? Artistic? Contemplative? We did not know, but we knew enough to not disturb. At one end of the courtyard was a very large lake. The entire area was, in itself, a fine work of art. 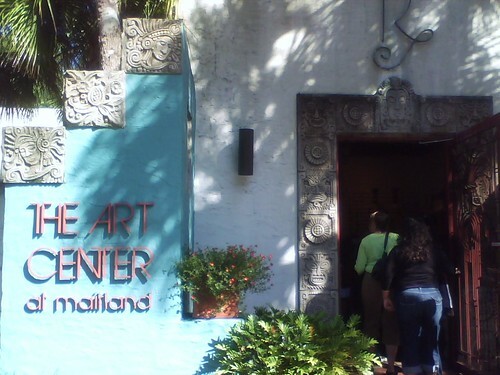 Literature at the center informs us that the Maitland Art Center was founded in 1937 by Jules Andre Smith with an additional gift from Mary Curtis Bok (later Mrs. Efram Zimbalist, Sr.) Normally, I like to research and post more detailed information about the topic of my blog. 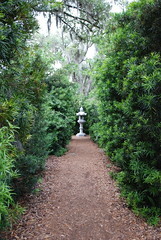 However, there is something about the Maitland Art Center that is calling to me to not focus on the history or factual. I will only report that in 1982 it was entered on the National Register of Historic Places and one critic has called it one of the “important examples of Fantastic architecture in America,” whatever that means. That is the Maitland Art Center. Definitely off-the-beaten-path and a Must See for the well informed traveler looking for More Than a Mouse™.